Who will you trust with your assets? 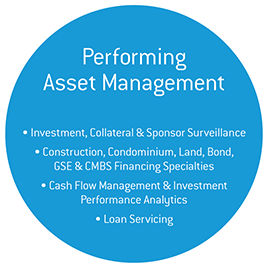 Our highly experienced Performing Asset Management team brings true mastery, at both the asset and fund level, to the mitigation of risk, the management of relationships, and the handling of information necessary to secure the performance of each investment. Our hands-on approach with both debt and equity positions creates a true partnership with our clients that allows us to execute on any type of deal, transaction or special situation. We are dedicated to working tirelessly to provide our clients with the critical analysis and feedback necessary to ensure the ongoing success of each investment. 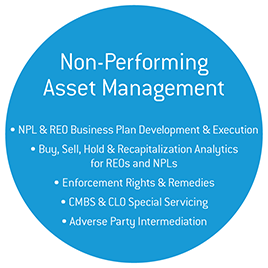 Non-Performing Asset Management has been an integral part of Trimont’s business since its inception more than 30 years ago. Our professionals bring true real estate expertise to every deal with the sole goal of managing clients’ costs, minimizing losses and maximizing returns. With more than $30 billion in successfully resolved investments, our track record is the result of utilizing high-touch, high-service disposition strategies for modifications, foreclosure and asset sales. We are driven to be responsive and are dedicated to serving our clients, leveraging our established platform and processes to efficiently manage and resolve assets in both the securitized and non-securitized markets. When it comes to resolving problems for our clients there is no substitute for experience, and our Non-Performing Asset Management team has seen it all. Partnering with users and providers of capital, Trimont is the trusted source for independent analysis and perspectives on the financial risks inherent in commercial real estate throughout the capital stack. We provide Underwriting & Advisory services to our clients both pre- and post-investment, thereby helping them constantly evaluate risk and return in the face of ever-changing circumstances. In underwriting more than $20 billion annually across all property and investment types, our professionals deliver exceptional precision and value, understanding the critical decisions that weigh on investment committees every day.